The Alienware 34 has serious gaming cred to make gamers gleeful. Gaming peripherals don’t need to be garish. But what this Alienware gaming monitor lacks in flash, it makes up for in performance. With a 4ms response time, an overclockable 120Hz refresh rate, and G-Sync capabilities, it checks all the boxes for serious gamers. The 34-inch size and curved ultrawide screen don’t hurt either. The grown-up aesthetics of the AW3418DW go a long way to help make its premium $999 sticker price — down from a whopping $1,499 — more palatable. 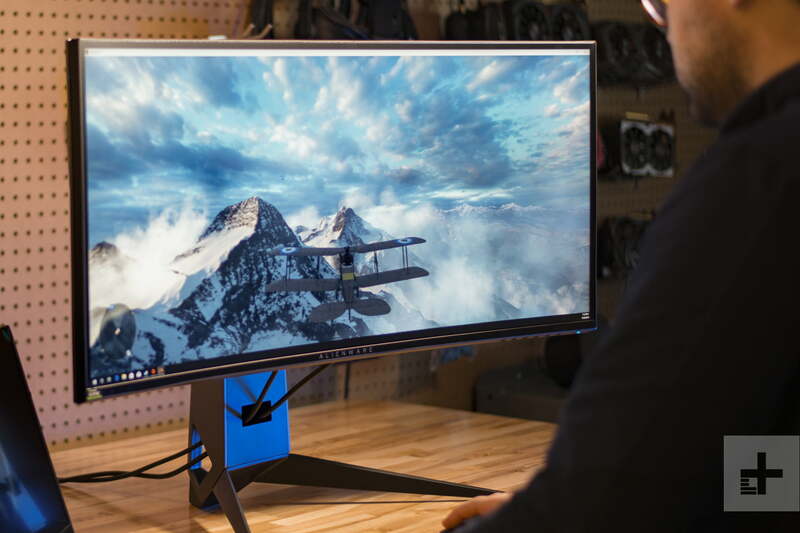 This ultrawide monitor can grow with you, whether you need to it to immerse yourself in fast-action games or to juggle productivity tasks. 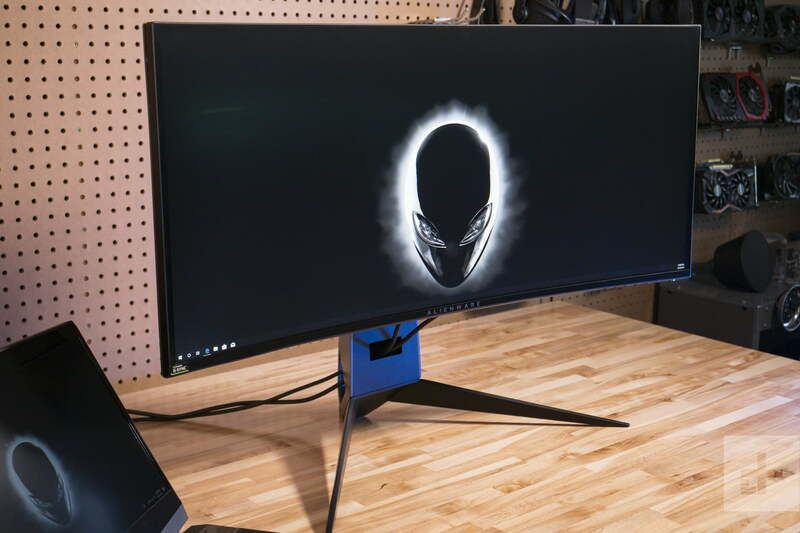 Unless you spot the glowing alien head logo on the back, nothing about the Alienware AW3418DW screams it’s made for gaming. 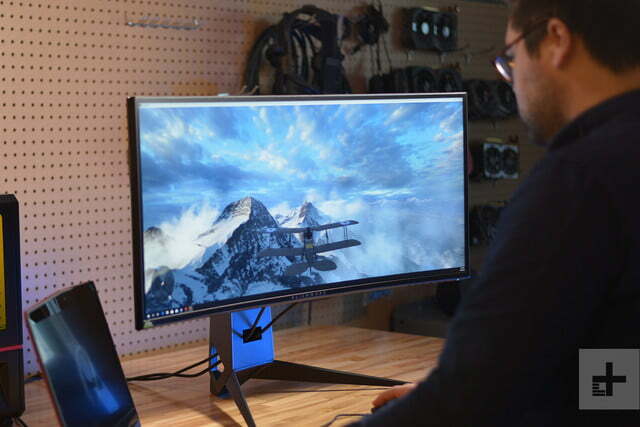 With minimal black bezels on the front and a cloaked in dark gunmetal titanium hue on the back, this monitor feels just at home next to any one of Dell’s business-centric 4K displays or rival Lenovo’s ThinkVision monitors. In fact, the AW3418DW’s aesthetics is not entirely dissimilar to its business-centric cousin, the Dell Ultrasharp U3818DW. That’s not a bad thing since both come with stylish designs. 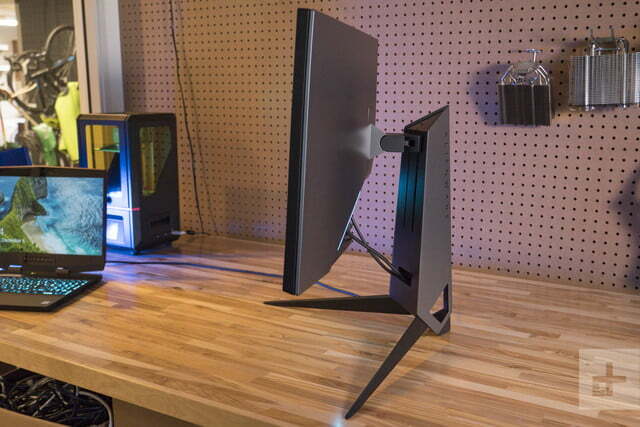 The Alienware AW3418DW ships in two parts: The 34-inch curved panel and a weighty metal stand with Y-shaped legs. It also comes with its own VESA mount the display panel can attach itself to. If you have your own VESA-compatible wall mount or more compact desk stand, you can use that instead to conserve desktop space. Setting up the monitor required no tools and took just a few seconds to snap the monitor onto the stand. 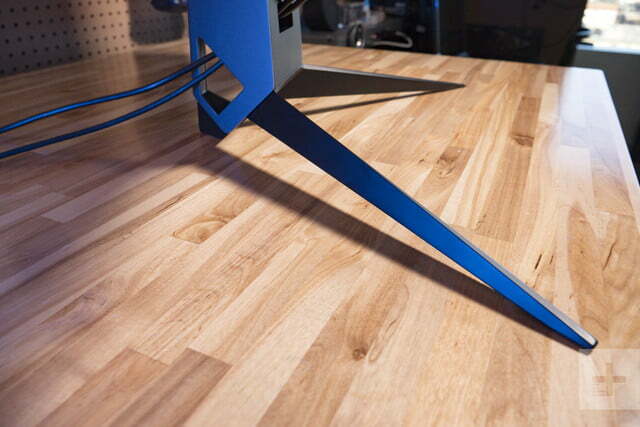 The included stand includes plenty of adjustment options — it allows the panel to tilt 25 degrees upwards or 5 degrees downward, swivel 40 degrees in either direction, or raised and lowered by a height of 5.1 inches. The ergonomic design makes this panel just as good a choice in an office setting as in a game room. Adjustable LED lighting strips are discreetly placed on the angular spines on the backside of the panel as well as on the stand. 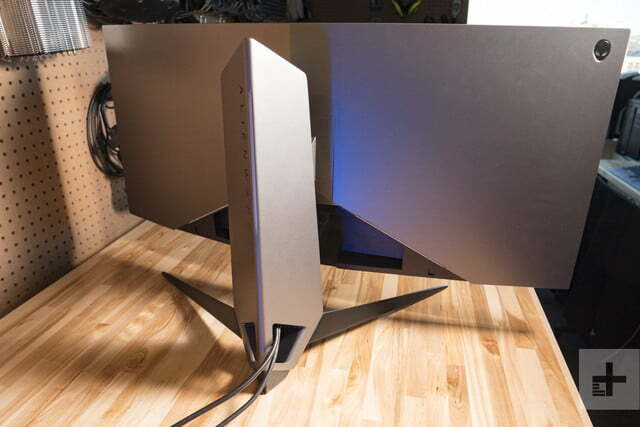 Unlike the competing ASUS ROG Swift PG348Q curved 34-inch monitor, which comes with an embossed patterned back, aggressive vents, and a flashier lighting design, the Alienware feels like a much more minimalist piece. That’s refreshing given its gaming focus and the brand’s gaming heritage. 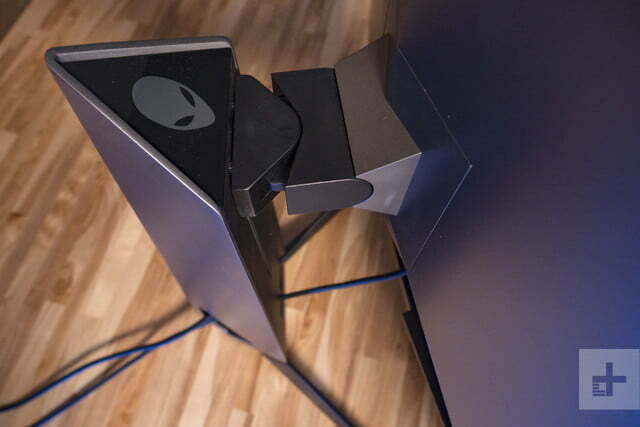 Vents on the Alienware are placed at the top and on the bottom edges and cutouts near the base of the stand serves as a clever cable management system to route your cords through. The panel feels solid, and the bezels around the edges are very minimal, like most modern monitors in the premium space. To keep the aesthetics of the AW3418DW clean required Dell to make some sacrifices in how the ports are configured. All of the monitor’s ports are located are bottom-facing. Because you’re not able to rotate the display vertically (given the wide width of the panel), this makes accessing the ports difficult. The monitor comes with a power connector, line-out port, USB with power charging, headphone jack, USB 3.0 port, and a USB upstream port. On the bottom front, you’’ have access to a USB port with power charging, a headphone jack, and a USB 3.0 port. These ports make it easy to quick to connect peripherals, like a flash drive. 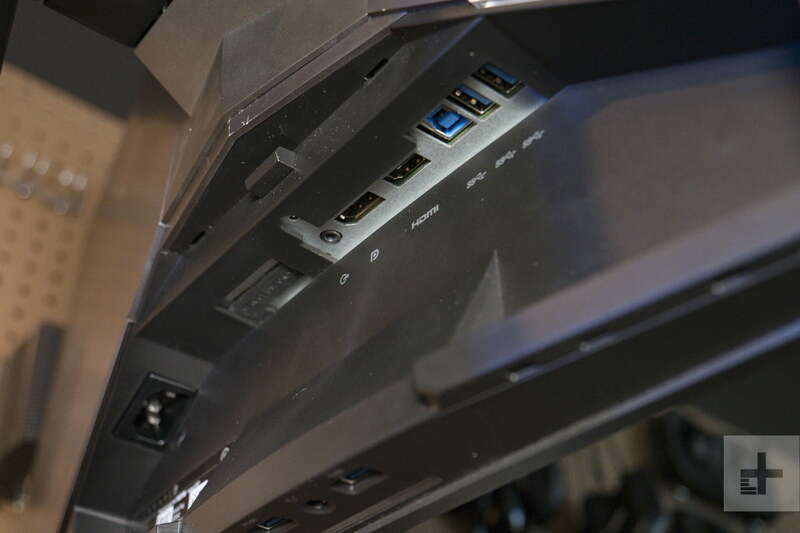 On the bottom rear, you’ll find an awkwardly placed power port, an HDMI port, a DisplayPort, a USB-B upstream port, and two USB 3.0 ports. Given its age, it’s surprising that Dell didn’t equip this monitor with a USB-C port, which would have allowed a single cable connection to a compatible laptop, like Dell’s own XPS 13. A USB-C connection would also have negated the need for the USB-B upstream port to drive hub on the monitor. The good news is that the monitor doesn’t require a bulky external power brick. The bad news? The supplied cable is somewhat short. The AW3418DW’s settings are all accessible via six menu buttons on the bottom right edge of the panel in addition to a separate power button, making for a cluster of seven total buttons. The buttons are tactile and easy to press, and unlike some home monitors, they’re physical keys and not capacitive touch keys. Out of the box, the first four buttons are pre-configured for preset modes, overclock refresh rates, dark stabilizer, and brightness/contrast controls. The fifth button brings up a menu, which you can navigate to change any of the mentioned settings, re-configure the buttons, or even adjust and change the AlienFX lighting on your monitor. 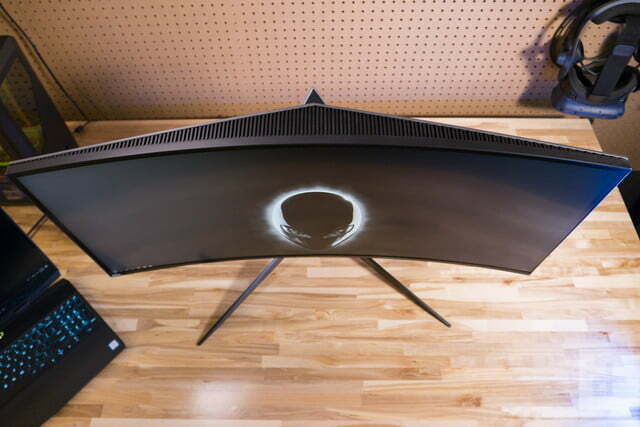 The star of the Alienware AW3418DW show is the 34-inch IPS panel, which sports a wide QHD resolution of 3,440 x 1,440 pixels. There are a number of different modes that help tune the monitor, depending on the game that you’re playing. Standard works well for most office or home application, but you’ll also have options for FPS, RTS, and RPG, as well as three customizable settings. Using a customizable game settings gives you granular adjustments to the R, G, B, C, M, Y settings to achieve the right color calibration desired for your game. ComfortView, Warm, Cool, and Custom Color round out the presets. In general, switching between FPS, RTS, or RGP generally brightens up the panel a bit, compared to the standard view, and the panel’s color temperature can also shift between being slightly warmer or cooler based on the mode that you’re in. In general, I kept the panel on standard for office tasks, ComfortView for working at night to help reduce eye strain, and FPS for game play. You can also make adjustments to response times for the presets by navigating the in-depth menu interface. Though there isn’t an HDR option on this Alienware Panel, the dark stabilizer option gives you four adjustments to help bring out details in the shadow. While adjusting the brightness would brighten or darken everything on the screen, dark stabilizer is used to just brighten or darken the darker areas on your screen, serving as kind of a manual HDR control. And although all the items in the menus are arranged in an easy to understand list view, changing the settings can be tedious, as you have to scroll through lists and menus. Fortunately, once everything is customized, you won’t have to repeat your customizations after. The star of the show on the Alienware AW3418DW is the 34-inch IPS panel, which has a wide QHD resolution of 3,440 x 1,440 pixels. This gives the panel a density of 109 PPI and a 21:9 aspect ratio. It’s bound to delight your peripheral vision and immerse yourself in whatever content you’re viewing. The curved, ultra-wide panel also negates the need for a multi-monitor setup for most users, as there’s plenty of viewable screen area here. To truly take advantage of the AW3418DW and really push the limits on games, you’ll need to have a good graphics card. The IPS panel offers a bright display with wide viewing angles. The screen can go as bright as 300 nits, and gamers will likely want to dim the screen to under fifty percent for most games. In games with darker scenes, enabling the dark stabilizer setting makes a big difference in being able to see some of the details in the background. 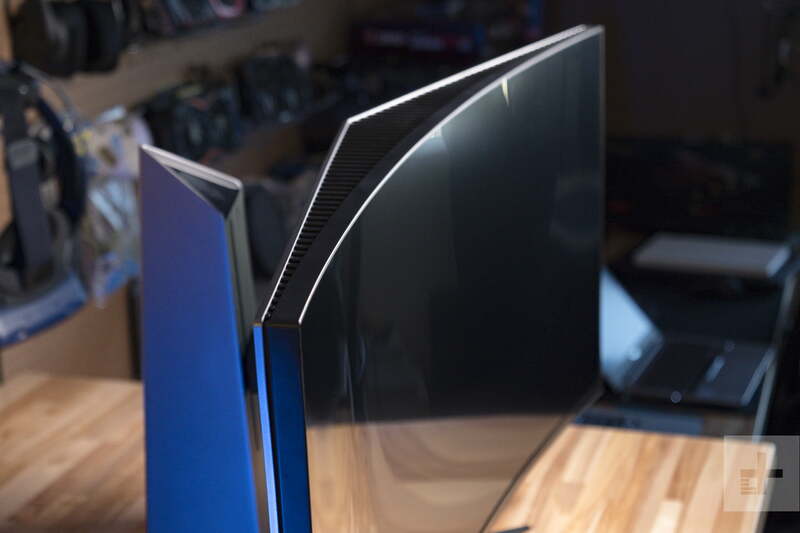 The panel is very high quality, and even on brighter settings, we didn’t see any light bleed around the edges, nor was there any instance of IPS glow. The panel’s individual specifications aren’t always the best. There are larger screens on the market, and some with higher pixel count, better 4K resolution, or even faster refresh rates, but the AW3418DW is one of the few ultra-wide panels that sports a 100Hz refresh rate that’s overclockable to 120Hz. To test the panel’s performance, we used Datacolor’s Spyder5Elite colorimeter with the display’s “Standard” preset. The Spyder5 utility showed that the panel achieved 100 percent of sRGB, 77 percent of NTSC, and 80 percent of AdobeRGB color space. The panel also exhibited excellent contrast, with a 660:1 ratio at maximum brightness, which is within range of the Dell U3818DW’s 680:1 and the Asus PG279Q’s 630:1. Color accuracy is similarly excellent, and the Alienware is more accurate in rendering colors than the Dell or the Asus in this category. 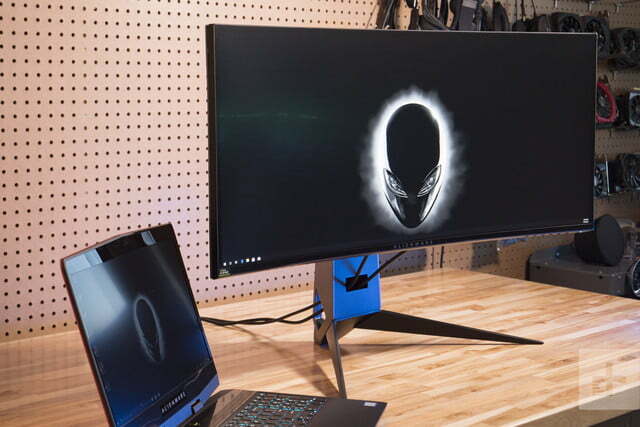 Compared to its ultrawide rivals like the Asus ROG Swift PG348Q –which shares a similar 34-inch curved WQHD resolution and 100Hz refresh rate — the Alienware edges ahead as the panel’s refresh can be overclocked up to 120Hz. The Asus ROG Swift PG279Q has an insanely fast 165Hz refresh rate, but comes with a smaller 27-inch non-curved and non-ultrawide panel. Compared to office monitors with a standard 60Hz refresh rate, you’ll definitely see a noticeable performance jump going to 100Hz paired with Nvidia’s G-Sync technology. The jump between 100Hz to 120Hz isn’t quite as dramatic, but you it’s definitely perceivable in action and sports titles, like Battlefield V, Call of Duty, and Deus Ex: Mankind Divided. We didn’t notice any screen tearing during our review on a variety of different games. To take advantage of the maximum performance of this monitor and really push the limits on games, you’ll need to have a good graphics card. In our setup, we used an Nvidia GTX 1080 Ti to test the unit, and opted to push the settings in our games to high or ultra high. And even though you can adjust the response time between normal, fast, and super fast in the response time menu on the display, we found there’s slight ghosting when super fast is selected. In general, most gamers will likely keep this menu option to normal or fast, especially since the AW3418DW already comes with a 4ms gray-to-gray response time. This isn’t quite as fast as the 1ms response time of the Alienware AW2518H, but that’s a smaller 25-inch panel with a lower FHD resolution. This Alienware AW3418DW strikes a good balance between screen size, performance, and aesthetics. It’s an all-around winner that’s versatile enough to be a desk monitor or the window into your game play. Our review unit comes well-calibrated out of the box, and there was very little perceptible difference in the display after running Datacolor’s calibration tool. Post calibration, the screen was a bit warmer, as the Alienware’s standard preset is a bit on cooler side. There is little change in the benchmark results post-calibration, which is good news for those looking to adopt this ultra-wide panel for a production setting. When it comes to unwavering quality, Dell puts its money where it’s mouth is. Not only does Dell’s attention to detail and design show through in the build of the Alienware AW3418DW, but the company also backs up its commitment to delivering the best product it can through its generous warranty. The AW3418DW comes with a standard three-year limited warranty as well as Dell’s three-year advanced exchange service and premium panel guarantee. If your screen or any part of the monitor is damaged — including dead or permanently lit bright pixels — Dell will begin the warranty claim process by troubleshooting the issue over the phone. If the issue cannot be fixed through phone support, Dell will send a replacement unit the next business day. “Even if only one bright pixel is found, a free monitor exchange is guaranteed during the Limited Guarantee/Warranty period,” the Dell claimed on its support page. This policy is far more generous than AOC’s policy, which only covers the LED panel for one year. At $1,000, you’ll be able to find monitors with faster 240Hz screen refresh rates, 1ms screen response times, and higher 4K resolutions, but all of those monitors are based on a flat panel design, so you won’t be able to benefit from the immersive experience that’s found on the AW3418DW’s curved screen. Neither do they support G-Sync. Those features make the Alienware 34 Curved Gaming Monitor the ideal partner to your powerful gaming rig. While the AW3418DW doesn’t have the best individual specifications on the market, it checks off enough boxes to make the sum of its parts greater than the individual components. 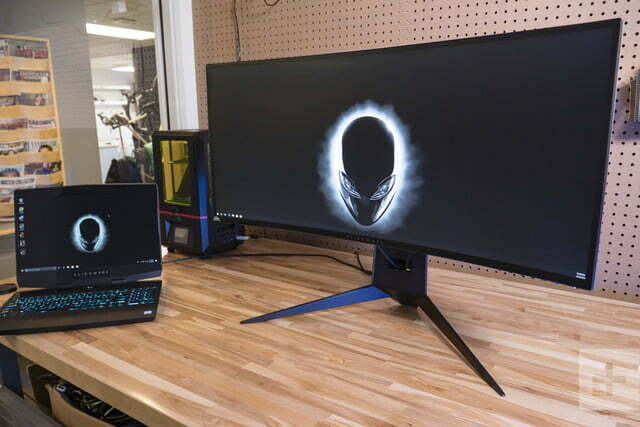 Compared to AOC’s $799 Agon AG352UCG, which offers a slightly larger 35-inch MVA panel, the Alienware comes with a better warranty, cleaner design, more color accurate IPS panel, and overclockable refresh rate performance. If you’re looking to match the 34-inch ultra-wide gaming form factor, LG’s FreeSync-enabled 34UM69G is priced at $305, but comes in at a lower WFHD resolution and lacks the curve of the Alienware. Samsung’s CHG90 comes in at the same price as the AW3418DW, and this display will dwarf your desk at 49 inches and comes with a faster 144Hz refresh rate. However, the CHG90 uses FreeSync technology, limiting its appeal to gamers who use AMD graphics. Serious gamers may be wooed by Acer’s $1,200 38-inch XR382CQK, which comes with integrated speakers and faster 1ms screen response time, but that panel also uses FreeSync rather than the Alienware’s G-Sync capabilities. AOC’s Agon AG251FZ comes with a stutter-free 240Hz refresh rate and 1ms response time, but its flat panel lacks the immersive ultrawide curve of the AW3418DW. The closest contender the AW3418DW is the BenQ FreeSync-capable EX3501R, a display that shares the AW3418DW’s similar $900 price, curved screen, performance, understated aesthetics, and support for a wide color space. However, the BenQ edges ahead with a slightly larger 35-inch panel and HDR support, while the AW3418DW holds its ground with a faster overclockable 120Hz refresh rate and G-Sync support. The lack of a USB-C port is a bit unfortunate given the AW3418DW ships with a generous three-year warranty, is solidly constructed, and comes with a brilliant display that will make your investment last for some time to come. However, VESA mounting compatibility and accurate colors and contrast will make the AW3418DW a solid option for office workers looking for an alternative to stale monitors on the market today, provided they don’t need integrated speakers. Yes, despite its high $1,000 price tag after discounts, we still recommend this monitor for its excellently calibrated panel, premium design, and performance. Not only is the AW3418DW well-constructed and solidly built, Dell’s generous warranty policy will give you the peace of mind that your investment will last for years to come.